Growing up on the family farm, I have always tried to be a good steward of the earth. My dad said he took his livelihood from the soil and we needed to be respectful of it, take care of our environmental resources, and give back to the earth. As a florist, I have always worked to minimize waste and to recycle and repurpose as much as possible. I love to visit thrift shops where I am like a kid in a candy store searching for hidden treasures that can be reused. Glassware can be sterilized and reused many times. I even have some clients who leave boxes of vases at the door of my studio for recycling. One thing that can’t be reused is florist foam. It was invented by the Smithers-Oasis Company in the 1950s and has many benefits. It holds quite a bit of water to keep flower stems submerged and drinking, it is pH balanced, it supports large stems in tall arrangements, and just creates a stable base for designing flowers. But it can only be used one time and then is thrown in the garbage. It doesn’t break down in landfills. It is a plastic material that is made from phenol reacting to formaldehyde, then air is added to turn it into foam. It is treated with detergents to give it its unique ability to soak up water. It is harmful to breathe the dust created when you cut it. It is not biodegradable. It can take hundreds of years to break down, if at all. It ends up in the water stream when it goes down the drain, and although it is not considered toxic because of the relatively small amount of formaldehyde present, organisms eat it, and that can’t be healthy. Oasis developed a new formula that claims to have enhanced biodegradability. It is supposed to completely break down in a biologically active landfill within 567 days—that’s almost 19 months. The only trouble is landfills are “anaerobic”—inactive environments. They store garbage, not decompose it. While I cannot claim to be 100% free of florist foam, I have found a way to drastically reduce my consumption of it. Thanks to our industry’s own Holly Chapple, who created the reusable plastic egg and pillow armatures for Syndicate Sales, most arrangements can be adapted to this new design method. It has revolutionized the way I design, and gives a more natural growth-habit look and feel to my work. I liken it to the way flowers grow naturally. It saves time and allows you to use less material—you don’t have to “cover mechanics” with greens or moss, and overall it just makes better sense to take care of our earth. I was so excited about the Rutgers study on the benefits of seniors receiving flowers, that I decided to launch the “Welcome Home” program at Riverwalk Village. This all came about because my friend, Janet Leonard recently moved her mother into Riverwalk Village, and naturally, there was some sadness from leaving the family home of 70 years. I decided Miss Audrey should have a bouquet of flowers in her room upon her arrival. That went over so well, I decided every new resident should be greeted with flowers, and so “Welcome Home” seemed like a neat idea to spread some cheer and promote the power of flowers. Flowers enhance the lives of seniors. Flowers are an instant mood-enhancer and provide happiness. In case you need proof of the power of flowers, check out the recent study done by Rutgers University on the health effects of receiving flowers on senior citizens. There are over 40 million senior citizens in America, and the number grows constantly. Seniors face so many challenges as they age. They give up independence, experience depression, memory loss, health issues, social withdrawal, and loneliness. These all take a toll on their health. Anything that can ease these anxieties would be of great benefit to the aging population. Rutgers University recently conducted a six-month study that demonstrated how flowers ease depression, inspire social networking, and refresh memory. 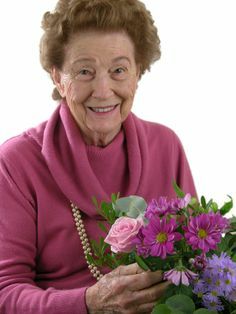 More than 100 seniors participated in the study, in which some received flowers at different intervals, and others did not receive flowers at all. The results were fascinating, but not surprising, in terms of how flowers help seniors cope with the challenges of aging. Seniors performed higher on everyday memory tasks and experienced enriched personal memories in the presence of flowers. Those who received flowers re-engaged with members of their communities and enlarged their social contacts to include more neighbors, religious support, and even medical personnel. 81 Percent of seniors who participated in the study reported that they experienced less depression after they had received flowers. 40 percent of participants displayed a change in behavior in terms of social activities, making social contacts beyond their normal circle of family and close friends. Most importantly, 72 percent of the seniors who received flowers scored very high on memory tests in comparison with seniors who did not receive flowers. The results of this study are excellent news for anyone wanting to improve the health and longevity of an aging loved one: Make flowers a regular part of their day, and help them live happy, fulfilling lives for years to come! 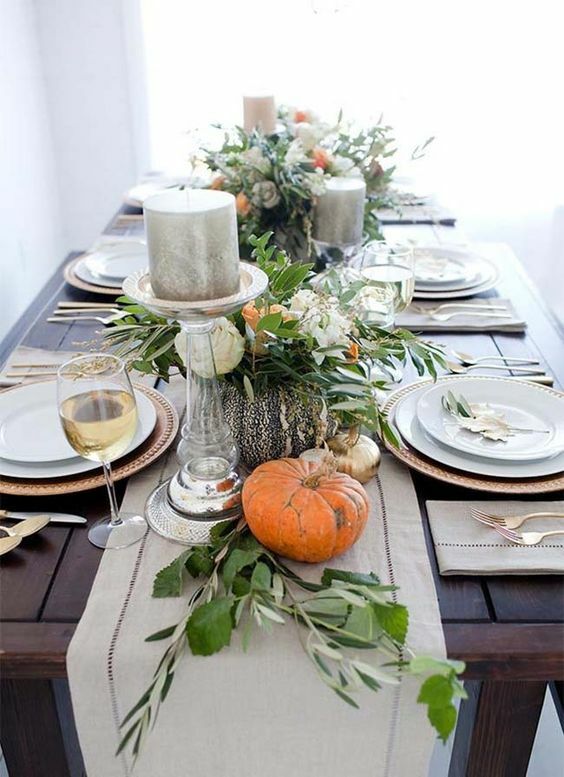 If you are entertaining for the holiday, you should decorate your table, even if you don’t order a centerpiece from a florist. I am going to share a few DIY ideas to make your table amazing! Start with a table runner. 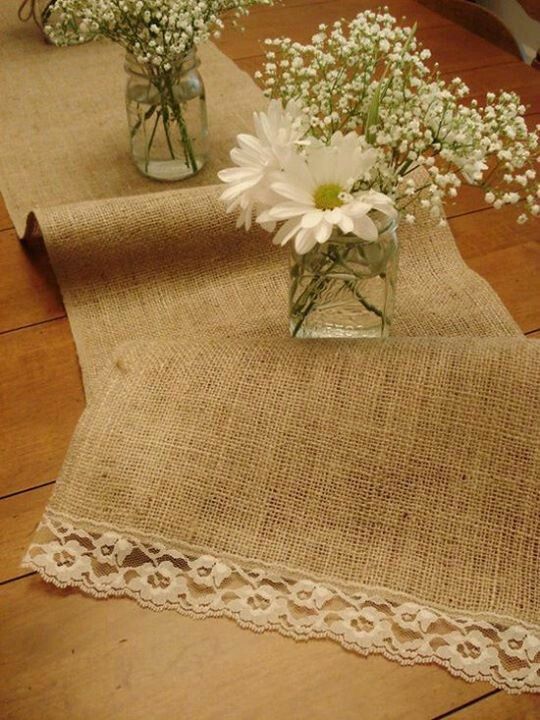 Burlap is great for fall, and this one is rustic/chic with a bit of lace. But any fall table runner will do. Lay a garland out across the length of the table. 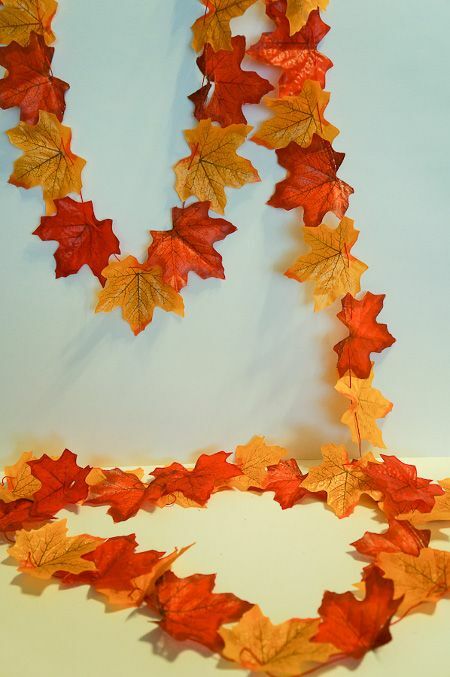 This can be an inexpensive leaf garland like this one, available at Hobby Lobby. Or you may wish to use fresh bay leaf or seeded eucalyptus simply lying loose. 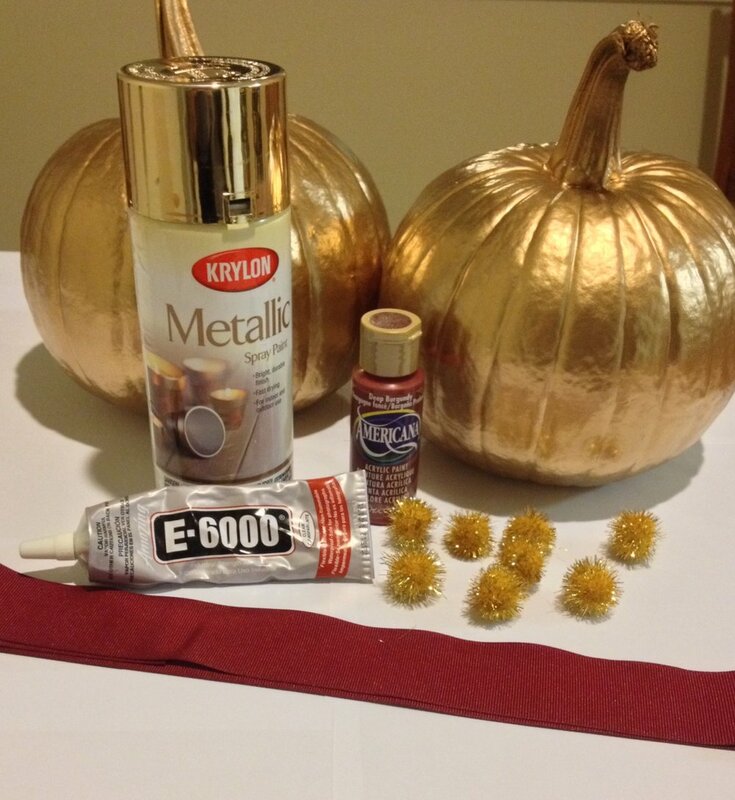 Spray paint some pumpkins with metallic gold—it covers well and looks great with the fall colors. Use different sizes of pumpkins for interest. 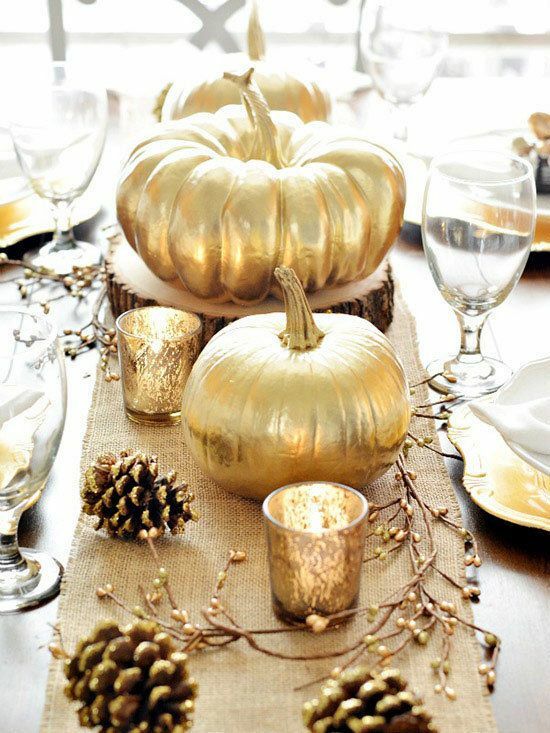 Arrange the pumpkins on the table. You can add in pine cones, berries, or bittersweet. Candles in various sizes complete the look. Happy Thanksgiving! Most of my regular clientele know that I have structured my business a little differently than most traditional florist shops. For one, Greene Florist is a studio--meaning there is no walk-in shopping. Orders are made by phone or online. I also am completely independent of any and all wire services, such as FTD or Teleflora. In the past, I have offered out-of-town floral service to all customers. I would place the order for the customer, using a shop in that town that I had researched or had some prior connection to. I am announcing a new policy effective immediately. While I am happy to continue placing out-of-town orders for my current clients, I will no longer be offering this service. I encourage you to google a shop in the city you want to send and place the order with your credit card. In the event something goes wrong, I have no recourse. You may ask why not belong to a wire service then? My business model has always been independence--no look-alike bouquets, no specialty "collector" containers, and no 27% cut in the value of the order. Not Your Mother's Prom Corsage! Elegant and glitzy, this wrist corsage features spray roses, eryngium, and rhinestones, embellished with gold tendrils. Bohemian Chic is a design style that is driven by the fashion industry, and is fast becoming the hottest new trend in the floral industry. It is defined by an appreciation for the effortless and subtle beauty of nature. Boho-chic style embodies natural, organic elements. It's free-flowing, has that "just picked from the garden" look, is not chaotic, but not that stuffy look of early floral design school compositions. It's wild and whimsical, original and unique, non-conformist. A bohemian is defined as a person who has informal and unconventional social habits, especially an artist or writer, who lives by their own rules, their own definition of style, and does not often conform to social style guidelines. Growing up studying music, I spent 5 years in the Indianapolis Youth Symphony where I was exposed to music and ballet on the campus of Butler University. I found the arts to be intriguing and intoxicating and these memories have influenced my design style. I liken it to piano study. I studied piano for 16 years. Then I met a woman named Beverly Howard who never had a lesson but played more beautifully than I had ever heard, using embellishments, key changes, and improvisations so masterfully. I had to ask myself why I was not doing this. I came to see that although I value education--music theory and hours and hours of practice reading written music, you can develop a constrained approach. Doing everything by rote limits creativity and freedom of style. The same can be said in floral design. Design school, class after class, mechanics,--all are important in learning a basic foundation, as well as a good understanding of the principles of design. But sooner or later you have to spread your wings and leave the comfortable nest of convention and rules. In studying natural growth habit, you just see flowers and foliages and they all seem to be growing together in perfect harmony without a focal point, form, line, or contrived position of flowers. It's kind of like the old Dutch masters' paintings where fantastic flowers seen to just spill out of the vase landing in their positions at random. They just reach for the light. Bohemian style lets you be your true self. Let your light shine out in beautiful rays upon the world. What could be more romantic than beautiful red roses and delicious chocolates? Greene Florist has partnered with Azalea Desserts to bring you an irresistible Valentine's package sure to delight! For the week of Valentine's Day only, Friday, February 9 through midnight on Monday, February 12, we are offering this amazing Valentine's gift package for only $99. One behind-the-scenes facet of floral design that is really important is mechanics. Without good mechanics, some of those tall party pieces or even large funeral arrangements would fall apart at the first roundabout taken too fast, or the first time the delivery driver has to slam on the brakes to prevent a rear-end collision with another driver whose attention is being taken up by a cell phone. You may ask--mechanics? Mechanics are those techniques that create stability and assure the design gets there in one piece. As a child growing up on the farm, I was fascinated with my Dad's tool shed. There were so many tools in there and the ideas would just flow every time I ventured out there. I later honed those mechanical skills in design school, but everything has a start--right? I wanted to offer some information that will be helpful in "undoing some mechanics"--namely hot glue. If you ever want to remove hot glue without damaging a figurine or other such glued item, simply apply rubbing alcohol to the glue and that will dissolve it. I like to use a small artist paintbrush--it gets into the crevices easily and coats the glue. Every December the Pantone Color Institute selects a Color of the Year that not only influences design and fashion industries, but also captures the spirit of the times. Pantone has once again hit a perfect note with their 2018 Color of the Year: Ultra Violet--a dramatically provocative and thoughtful purple shade. Ultra Violet communicates originality, ingenuity, and visionary thinking that points us to the future. According to Laurie Pressman, vice president of Pantone Color Institute, the ultra violet color represents a true reflection of what's needed in our world today. Now that Pantone has announced the color of the year, it is certainly worth looking at what colors are expected to trend next year. Keeping in touch with market trends will help predict customer demands, especially for high volume order times like Valentines Day and wedding season. On the trending colors for 2018, experts agree that millennial pink is here to stay. This popular light shade of blush most closely resembles rose pink in the flower world, but the definition has broadened to include a wider range of shades. From lighter neutrals to brighter summer hues, millennial pink is a common choice for retail packaging, makeup palettes, accessories, and home decor. This particular shade takes on a more social context as it is a less feminine pink that rebrands the color in a more thoughtful and mature way. Millennial pink speaks to a generation that strives for equality and questions traditional norms. Similarly, iridescence is irresistible. According to Pantone executive director Leatrice Eiseman, the human eye can't avoid anything translucent. In the same vein, eye-catcing metallics in more neutral tones are expected to remain popular. Finally, bold colors are expected to take over; Eiseman predicts a move away from pastels and toward more intense colors which reflect our more intense lifestyles and thought processes.